Electronic signs can help you reach new customers by advertising to drive-by or pedestrian traffic, and they build location branding. Electronic messaging signs help all types of businesses and facilities, like banks, churches, gas stations, airports, auto dealerships, theaters, military bases, government facilities and more. 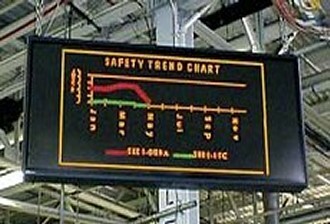 Most entities seeking to communicate a message can benefit from indoor or outdoor electronic programmable, scrolling signs. 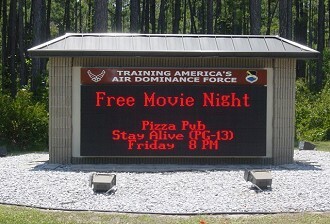 Electronic signs are available in red, amber, or full color video for eye-catching, high-impact advertising. 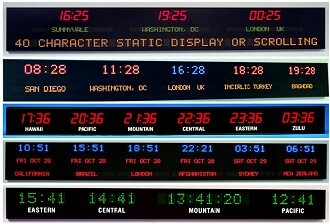 From single line scrolling tickers to multiple line electronic custom message center signs, we have them all. Our electronic display signs can't be beat! Popular ways to capture the attention of passers-by include electronic outdoor signs that display the time and temperature, or indoor world time zone clocks that mount on the wall. 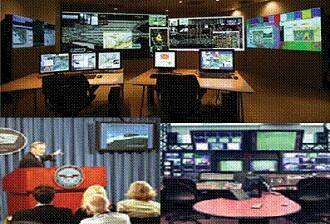 We specialize in Military and Government facilities. See a partial list of some of our customers on the GSA page.